KH-8 or Gambit-3 was the second generation of Gambit high resolution reconnaissance satellites. The KH-8 Block 4 were the fourth iteration of this design, introducing an several improvements. KH-8 Block 3 had the same basic layout as the KH-8 (Block 3) series. The forward part was joint via a roll joint with the Agena-D. The major subsystems of the satellite included a photographic-payload section (PPS), a satellite-control section (SCS), and the booster vehicle. 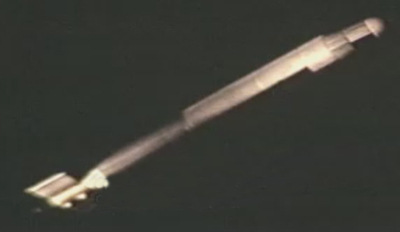 The payload section contained a camera module and two satellite recovery-vehicles (SRV). The control section included the command system, the orbit-adjust module, an attitude-control subsystem, a back-up stabilization system (BUSS), and the power supply. The next 6 satellites of the KH-8 Block 4 series (KH-8 48 to 51 and 53 to 54) featured a number of improvements: Major improvements for the PPS were the dual-platen camera, an improved film drive, a new elastomeric heat shield, a new focus system, improved redundancy and reliability, an improved parachute thermal cover, and increased telemetry. Major improvements in the SCS were a main engine baffled injector, solar arrays, added ascent-phase redundancy elements, added crossstrapping capabilities for redundant elements, improved failure-detection circuits, reduced single-point failure potential for the main engine, and the elimination of single-point failure in the roll-joint. The camera system was strip camera coupled to an optical system a focal length of 4.46 m. In the optical system the ground image is reflected by a steerable flat mirror to a 1.21 m diameter stationary concave primary mirror. The primary mirror reflects the light through an opening in the flat mirror and through a Ross corrector. At perigeum, the main camera imaged a 6.3 km wide ground swath on a 223.8 mm wide moving portion of film through a small slit aperture. The ground resolution was as small as 0.1 m or better, near the theoretical physical e resolution limit imposed by atmospheric turbulence. The Block 4 version was a dual platen version, which exposed, independently, both 9-inch and 5-inch film. It provided added versatility to the photographic subsystem by permitting (principally for the 5-inch film) use of other than high-resolution black-and-white film, including experimental films, color film, and false-color infrared. It also provided for adding over 3,800 feet of film for the 5-inch camera. The Astro-Position Terrain Camera (APTC) contained three cameras: a 75 mm focal length terrain frame camera, and two 90 mm focal length stellar cameras. The terrain frame camera takes exposures of Earth in direction of the vehicle roll position for attitude determination. The stellar cameras observed in 180° opposite directions and took images of star fields. KH-8 52 was de facto also a Block 4 satellite, but featured the KH-8 Dual Mode (Higherboy) modification for dual low and high resolution mission. This series used also the stretched Titan-3(24)B Agena-D version as launch vehicle. The KH-8 Block-4 satellites were succeeded by the KH-11 Kennen / Crystal electro-optical satellites. KH-8 48 (Gambit-3 48, Mission 4348, OPS 4915) 1977-019A 13.03.1977 Va SLC-4W Titan-3(24)B Agena-D .
KH-8 49 (Gambit-3 49, Mission 4349, OPS 7471) 1977-094A 23.09.1977 Va SLC-4W Titan-3(24)B Agena-D .